Providing you the best range of lab scale ampoule sealing machine with effective & timely delivery. We are a notable firm involved in manufacturing and supplying Lab Scale Ampoule Sealing Machine. These machines are widely accepted in the market for their rich attributes such as robustness and precise design. Owing to these prospects, these machines are widely used in pharmaceutical industries for filling ampoules. 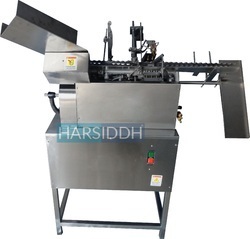 Equipped with single head for filling, our offered machines are available to customers at nominal price tags.